As many as 100,000 Mongolians—nearly 20 percent of the country’s rural workforce—work as independent and unlicensed miners, sifting the dirt for the smallest flecks of gold. 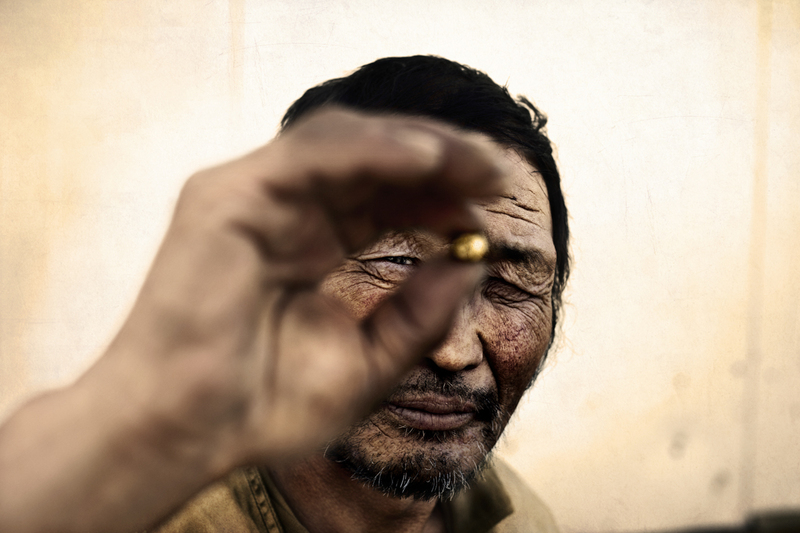 Spanish photographer Alvaro Laiz is fascinated by this trend and chronicles this dangerous endeavor in Ninjas: Gold Rush In Mongolia. “I’ve been always interested in how human beings interact with our environment and how the search for natural resources affects us,” he says. The term “ninja” refers to the large green pans (used to carry ore and sift gold) the miners carry on their backs, which makes them look like the Teenage Mutant Ninja Turtles. It is a difficult way of life; these miners descend into shafts with little structural support and endure bitter cold or searing heat deep underground. There is little in the way of safety equipment or oversight as they chip away at the earth using rudimentary tools. “When I ventured down a shaft, the heat, the dust and the noise was so intense I couldn’t see my hands,” says Laiz. “I was there for 40 minutes. It felt like a century. Afterward, I saw with different eyes, the men who spend 10 hours each day down those same holes. All things told, the Mongolian economy is booming and The Economist says mining industries will drive the country’s economic growth at a faster rate than any other nation on earth in the next decade. The government recently acknowledged the ninjas’ contributions to society and their needs as a migratory and nebulous workforce, but the amateur miners remain at the bottom of the heap because of their crude methods and associated risks. Until there’s employment alternatives, it’s likely the ninjas will continue to speculate.